Fold out pages hold twelve 4x6 photos. White mesh background. Post binding accepts unlimited standard refills. Initial Capacity: 204 Photos. This Pioneer fold-out page photo album allows you to show up to 12 photos at once and folds back into a slim, compact design. 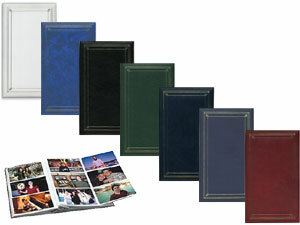 Overall album dimensions: 8" x 13-3/4"